Ed and MJ were dear personal friends of mine - even after I recruited them both to national positions. They were there for me in good times and bad, and even put me up at their home for a period of time when I was going through a divorce. I never heard MJ tell anyone "no" to a request - and sitting at the Nationals desk with her at many conventions, I heard some off the wall requests. 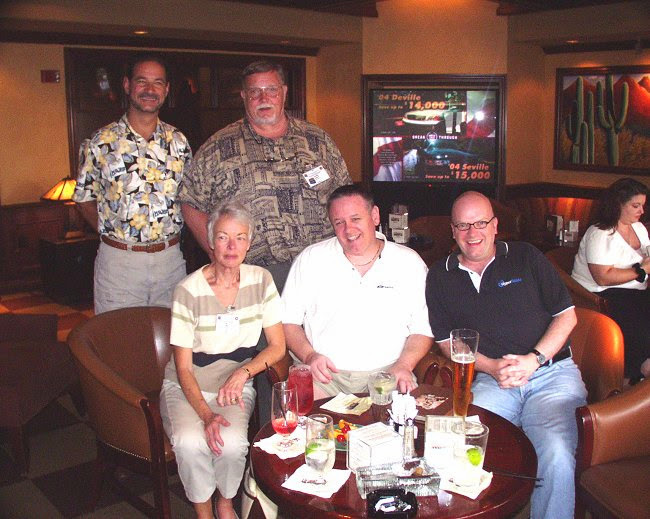 MJ had been Ed's office manager in his aircraft brokerage business and continued to work at CAK after his passing - I'm sure she had as many friends and fans in the world of corporate aircraft as she did in IPMS. I mentioned to someone the other day that she was the kind of person who, if you knocked on their door at 2AM, would bring you in and cook you a meal. Their home was a gathering place for family and friends - many of whom they treated as extended family - and I will miss the many wonderful cookouts on their deck. When Dave called me with the news, I felt like I'd lost a family member. I'm sure Ed's smiling now, but I will miss her (and him) terribly. I only met MJ in passing at the Nats but she always had a smile. MJ very patiently pursued a recurring mail issue that prevented my Journal delivery (finally solved by that plastic jacket - THANK YOU!). She sent several replacement issues and meanwhile helped me maintain a sense of humor about it. I did get the opportunity to thank her in person, at the CO Nats. What a sweetheart. Fair winds and following seas, Ed & MJ! I once tried to renew my IPMS membership with a credit card that I forgot I had canceled; I kept telling MJ the card should be good and she kept submitting it and telling me it wasn't - and being so incredibly polite the whole time. I got the impression she thought of all of us as members of her family. She and Ed were truly special people. Interests:Building mostly automotive subjects - especially Corvettes. Have begun building a couple of ship models - nice change of pace. I was very sad when I saw the first words in an email from my dear friend Fred Horky. I knew immediately what he was going to tell me and my eyes filled with tears as I read the news. Mary Jane was more than just the sweet lady at the Nationals Desk at the convention to me. We worked together for many years while I was Editor of the Journal. I like to feel that we became good friends over that time. She will be missed. "We are all travelers in this world, From the sweet grass to the packing house, birth until death, we travel between the eternities." MJ, thank you for traveling some of the journey with me and may you be "three days in heaven before the devil knows you are gone." So sad. Mary Jane was a truly helpful and knowledgeable person who was always there for the membership. The true depth of her contribution to the smooth functioning of the society cnnot be fully appreciated. These will be difficult shoes to fill indeed. We will all miss her. I was saddened to hear of MJ's passing. I interacted with her many times of behalf of our club via e-mail, phone calls, and in person at National conventions. I can only add to what has been said before. She was a special person who never failed to help us. MJ was a gracious, classy lady. We will miss her. Our condolences go out to her family. Interests:Aviation history (planes & people), all eras! Model in 1/72 dabble in 1/144. For those of us members who live outside the country and obviously to others, MJ was more than the voice of IPMS/USA, she was IPMS. Through the years I made several contacts with her (mail phone ,etc) and had the good fortune of meeting her several times, saying hello in Columbus has turned regretably into a farewell. Thank you from all of us. I am one of the lucky ones that often had the pleasure to see and enjoy MJ's company, charm and wit, being located only five minutes away from her and Ed's home. For years, six to twelve local modelers would visit Ed every Saturday in his 'model room' for what became known as the 'Quilting Club' and MJ was always the gracious host that would have fresh coffee and snacks for us. I then had the pleasure to interact with her as our Office Manager when I was appointed to replace Ed Kinney as the IPMS USA Treasurer. In that short time since, MJ was always a pleasure to deal with and professional in all things that she did for our society. She will be sorely missed. RIP MJ and God Bless. I am deeply saddened to learn of her death. She and Ed were great people! My condolences to their family.